Agelarakis, A,, 1993, The Shanidar Cave proto Neolithic human population: aspects of demography and paleopathology. Human Evolution 8: 235-253. Auffray, J.-C., Tchernov, E. and Nevo, E., 1988, Origine du commensalisme de la souris domestique (Mus musculus domesticus) vis-&-visde l'homme. Comptes Rendus de I'Academie des Sciences Paris 307: 517-522. Baruch, U., and Bottema, S., 1991, Palynological evidence for climatic changes in the Levant ca. 17,000-9,000B.P. In TheNatufian Culture in the Levant, edited by O. Bar-Yosef and F. R. Valla, pp. 11-20. International Monographs in Prehistory, Ann Arbor, Michigan. Bar-Yosef, O., 1983, The Natufian of the southern Levant. In The Hilly Flanks and Beyond, edited by C. T. Young, P. E. L. Smith, and P. Mortensen, Studies in Ancient Oriental Civilization, pp. 11-42. University of Chicago Press, Chicago, Illinois. Bar-Yosef, O., 1984, Seasonality among Neolithic Hunter-Gatherers in Southern Sinai. In Animals and Archaeology: Herders and Their Flocks, edited by J. Clutton-Brock and C. Grigson, pp, 145-160. British Archaeological Reports International Series 202, Oxford. Bar-Yosef, O., 1985, The Stone Age of the Sinai Peninsula. In Studi di Paleontologia in Onore i SalvatoreM. Puglisi, edited by M. Liverani, A. Palmieri, and P. Peroni, pp. 107-122. Universita di Rome "La Sapienza," Rome. Bar-Yosef, O., 1987, The Late Pleistocene in the Levant. In The Pleistocene Old World:Re-gional Perspectives, edited by O. Soffer,pp. 219-236. Plenum Press, New York. Bar-Yosef, O., 1998, The Natufian Culture in the Levant, threshold to the Origins of Agriculture. Evolutionay Anthropology 6(5): 159-177. Bar-Yosef, O., 1991, The Early Neolithic of the Levant: Recent Advances. TheReview ofAr-chaeology 12:1-18. Bar-Yosef, O., 1992, The Neolithic Period. In TheArchaeology of AncientIsrael, editedbyA. Ben-Tor, pp. 10-39. Yale University Press, New Haven, Connecticut. Bar-Yosef, O., 1997, Symbolic Expressions in Later Prehistory of the Levant—Why Are They Sofew?In Beyond Art:PleistoceneImage and Symbol, edited by M. D. Conkey,O. Soffer, and D. Stratman,pp. 161-187.California Academy of Sciences,San Francisco, California. Bar-Yosef, O., and Belfer-Cohen,A,, 1989a,The Origins of Sedentismand Farming Communities in the Levant. Journal ofWorldPrehistoy 3: 447-498. Bar-Yosef, O., and Belfer-Cohen, A,, 1989b, The Levantine "PPNB" Interaction Sphere. In People and Culture in Change, edited by I. Hershkovitz, pp, 59-72.British Archaeological Reports International Series 508, Oxford. Bar-Yosef, O., and Belfer-Cohen, A,, 1991, From Sedentary Hunter-Gatherers to Territorial Farmers in the Levant. In Between BandsandStates, edited by S. A. Gregg, pp. 181-202. Southern Illinois University, Carbondale, Illinois. Bar-Yosef, O., and Belfer-Cohen, A,, 1992, From Foraging to Farming in the Mediterranean Levant. In Transitions to Agriculture in Prehistory, edited by A. B. Gebauer and T. D. Price, pp., 21-48. Prehistory Press, Madison, Wisconsin. Bar-Yosef, O., and Tchernov, E., 1970,The Natufian Bone Industry of Hayonim Cave.Israel ExplorationJournal 20: 141-50. Bar-Yosef, O.,Arensburg, B., and Tchernov, E., 1974, Hayonim Cave: Natufian Cemetery and Settlement Remains. In Bemaaravo ShellHagalil, edited by M. Yeda'aya. Regional Councils of SulamZor and Ga'aton (in Hebrew). Belfer-Cohen,A,, 1988,The Appearance of Symbolic Expression in the Upper Pleistocene of the Levant as Compared to Western Europe. In L'Homme de Neandertal, Volume 5, La Pense, edited by M. Otte, pp. 25-29.ERAUL 32. Etudes etrecherches aarchéologiques de l'Université de Liege, Liège. Belfer-Cohen,A,, 1989a,The Natufian Graveyard in Hayonim Cave. Paléorient 14: 297-308. Belfer-Cohen,A,, 1989b,The Natufian issue:A Suggestion.In Investigationsin South Levantine Prehistory, edited by O. Bar-Yosef and B. Vandermeersch,pp. 297-307. British Archaeological Reports International Series 497, Oxford. Belfer-Cohen, A., 1991a, An in Hayonim Cave, a Case Study ofArt in a Natufian Context. In TheNatufian Culture in theLevant, edited by O. Bar-Yosef and F. R. Valla, pp. 569-588. International Monographs in Prehistory, Ann Arbor, Michigan. Belfer-Cohen,A,, 1991b,The Natufian in the Levant.Annual Review ofAnthropology 20: 167186. Belfer-Cohen,A., 1995, Rethinking Social Stratification in the Natufian Culture: the Evidence from Burials. In TheArchaeology ofDeath in theAncientNearEast, edited by S. Campbell and A. Green, pp. 9-16. Oxbow Monographs 51. Oxbow Books, Oxford..
Belfer-Cohen, A., Schepartz, L. A,, and Arensburg, B. 1991, New Biological Data for the Natufian Populations in Israel. In TheNatufian Culture in theLevant, edited by O. Bar-Yosef and F. R. Valla, pp. 411-424. International Monographs in Prehistory. Ann Arbor, Michigan. Bouchud,J. (ed.) 1987,LaFauna du GisementNatoufien deMallaha [Eynan)Israel. Memoires et Travaux du centre de Recherche Française de Jerusalem 4. Association Paléorient, Paris. Byrd, B. F., 1989, The Natufian: Settlement Variability and Economic Adaptations in the Levant at the End of the Pleistocene. Journal of World Prehistory 3: 159-197. Byrd, B. F., 1994a,Late Quaternary hunter-gatherer complexes in the Levant between 20,000 and 10,000 BP. In Late Quaternay Chronology andPaleoclimates oftheEastern Mediterranean, edited by O. Bar-Yosef and R. S. Kra, pp. 205-226. Tucson, Arizona. Byrd, B. F., 1994b, From Early Humans to Farmers and Herders—Recent Progress on Key Transitions in Southwest Asia. Journal of Archaeological Research 2: 221-253. Byrd, B. F., and C. M. Monahan, 1995, Death, Mortuary Ritual, and Natufian Social Structure. Journal of Anthropological Archaeology 14: 251-287. Cauvin, J. 1994, Naissance des Divinités, Naissance de L'Agriculture. CNRS, Paris. Cauvin, M. C., 1991, Du Natoufien au Levant nord? Jayroud et Mureybet (Syrie). In The Natufian Culture in the Levant, edited by O. Bar-Yosef and F. R. Valla , pp. 295-314. International Monographs in Prehistory, Ann Arbor, Michigan. Cohen, M. N., 1985, Prehistoric Hunter-Gatherers: The Meaning of Social Complexity. In Prehistoric Hunter-Gatherers: The Emergence of Cultural Complexity, edited by T. D. Price and J. A. Brown, pp. 99-22.Academic Press, New York. Cope,C., 1991,Gazelle Hunting Strategies in the Southern Levant. In TheNatufian Culturein the Levant, edited by O. Bar-Yosef and F. R. Valla, pp. 341-458. International Monographs in Prehistory, Ann Arbor, Michigan. Davis, S., 1983, The Age Profiles of Gazelles Predated by Ancient Man in Israel. Paléorient 9: 57-64. Dayan, T., and Simberloff, D., 1995, Natufian Gazelles: Proto-Domestication Reconsidered. Journal of Archaeological Science 22: 671-676. Edwards, P. C., 1987, Late Pleistocene Occupation in Wadi al-Hammeh, Jordan Valley. Unpublished Ph.D. Thesis, University of Sydney, Sydney. Fish, S. K., and Fish, P. R., 1991, Comparative Aspects of Paradigms for the Neolithic Transition in the Levant and the American Southwest. In Perspectives on the Past. Theoretical Biases in Mediterranean Hunter-Gatherers Research, edited by G.A. Clark, pp. 396-410. University of Pennsylvania Press, Philadelphia, Pennsylvania. Flannery, K. V., 1973,The origins of agriculture. Annual Review ofAnthropology 2: 271-310. Garrod, D. A. E., 1932, A New Mesolithic Industry: The Natufian ofPalestine. Journal ofRoyal Anthropological Institute 62: 257-269. Garrod, D. A. E., andBate, D. M. A,, 1937, TheStoneAgeofMountCarmel(Vol. 1). Clarendon Press, Oxford. Garrod, D. A. E., 1957, The Natufian Culture: The Life and Economy of a Mesolithic People in the Near East. Proceedings ofthe British Academy 43: 211-227. Goring-Morris, A. N., 1987, At the Edge: Terminal Pleistocene Hunter-Gatherers in the Negev and Sinai. British Archaeological Reports International Series 361, Oxford. Goring-Morris, A. N., 1991, The Harifian of the Southern Levant. In TheNatufian Culturein the Levant, edited by O. Bar-Yosef and F. R. Valla, 173-216. International Monographs in Prehistory, Ann Arbor, Michigan. Grognier, E. and Dupouy-Madre, M., 1974, Les Natoufiens du Nahal Oren, Israel. Etude anthropologique. Paléorient 2: 103-121. Hayden, B., 1990,Nimrods, Piscators, Pluckers, and Planters: the Emergence of Food Production. Journal of Anthropological Archaeology 9: 31-69. Henry, D. O., 1985,Preagricultural Sedentism: The Natufian Example. In Prehistoric Hunter-Gatherers: The Emergence of Cultural Complexity, edited by T. D. Price and J. A. Brown, pp. 365-384. Academic Press, New York. Henry, D., 1989, From Foraging to Agriculture. The Levant at the End of the Ice Age. University of Pennsylvania Press, Philadelphia, Pennsylvania. Henry, D., 1991, Foraging, Sedentism, and Adaptive Vigor in the Natufian: Rethinking the Linkages. In Perspectives on the Past. Theoretical Biases in Mediterranean Hunter-Gatherers Research, edited by G. A. Clark, pp. 353-370. University of Pennsylvania Press, Philadelphia, Pennsylvania. Henry, D., 1995, Prehistoric Cultural Ecology and Evolution. Plenum Press, New York. Hietala, H. J., and Stevens, D. E., 1977, Spatial Analysis: Multiple Procedures in Pattern Recognition Studies. American Antiquity 42: 539-559. Hillman, G. C., and Davies, M. S., 1990, Measured Domestication Rates in Wild Wheats and Barley under Primitive Cultivation, and Their Archaeological Implications. Journal of World Prehistory 4: 157-222. Hillman, G. C., Colledge, S., and Harris, D. R., 1989, Plant Food Economy During the Epi-Palaeolithic Period at Tell Abu Hureyra, Syria: Dietary Diversity, Seasonality and Modes of Exploitation. In Foraging and Farming: TheEvolution of Plant Exploitation, edited by G. C. Hillman and D. R. Harris, pp. 240-266.Unwin Hyman, London. Keeley, L. H., 1988, Hunter-Gatherer Economic Complexity and Population Pressure: A Cross-Cultural Analysis. Journal of Anthropological Archaeology 7: 373411. Kosse, K., 1994, The Evolution of Large, Complex Groups: A Hypothesis. Journal ofAnthro-pological Archaeology 13: 35-50. Kuijt, I., 1995, Pre-Pottery Neolithic A Settlement Variability: Evidence for Sociopolitical Developments in the Southern Levant. Journal of Mediterranean Archaeology 7: 165-192. Kuijt, I., 1996, Negotiating Equality through Titual: A Consideration of Late Natufian and Prepottery Neolithic A Period Mortuary Practices. Journal ofAnthropological Archaeology 15: 313-336. Lieberman, D. E., 1993, The Rise and Fall of Seasonal Mobility among Hunter-Gatherers: The Case of the Southern Levant. Current Anthropology 34: 599-632. Lieberman, D. E., and Shea,J. J., 1994,Behavioural Differences between Archaic and Modern Humans in the Levantine Mousterian. American Anthropologist 96: 300-332. Moore, A. M. T., 1985, The Development of Neolithic Societies in the Near East. In Advances in World Prehistory, Volume 4, edited by F. Wendorf and A. Close, pp. 1-69. Academic Press, New York. Moore, A. M. T., and Hillman, G. C., 1992, The Pleistocene to Holocene Transition and Human Economy in Southwest Asia: The Impact of the Younger Dryas. American Antiquity 57: 482-494. Ozdogan, M., and Ozdogan, A,, 1989,Cayonu: A Conspectus of Recent Work. Paleorient 15: 65-74. Perrot, J,,Ladiray, D., and Soliveres-Massei, O., 1988,LesHommes deMallaha (Eynan)Israel Memoires et Travaux du Centre de Recherche Francais de Jerusalem No. 71. Association Paleorient, Paris. Renfrew, C., 1978, The Anatomy of Innovation. In Approaches to Social Archaeology, edited by C. Renfrew, pp. 390-419. Harvard University Press, Cambridge, Massachusetts. Rollefson, G., 1987, Local and External Relations in the Levantine PPN Period: 'Ain Ghazal as a Regional Center. In Studies in the History and Archaeology ofJordan III, edited by A. Hadidi, pp. 29-32. Department of Antiquities, Amman. 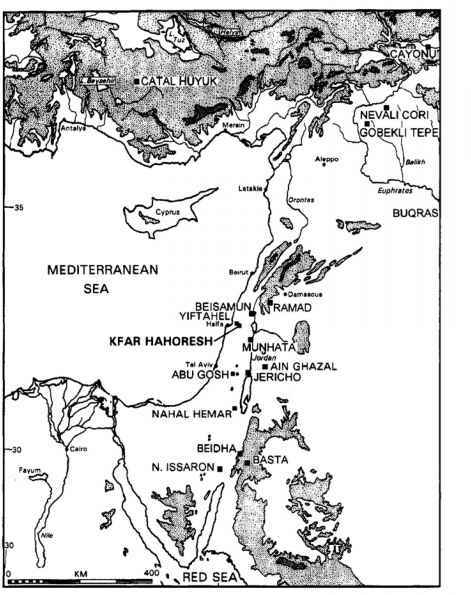 Rollefson, G., 1989, The Aceramic Neolithic of the Southern Levant: The View from 'Ain Ghazal. Paleorient 15: 135-140.
terranean Basin, edited by I. Hershkovitz, pp. 73-89. British Archaeological Reports International Series 508, Oxford. Rosenberg, M., and Davis, M., 1992, Hallan Çemi Tepesi, an Early Aceramic Neolithic Site in Eastern Anatolia: Some Preliminary Observations Concerning Material Culture. Anatolica 18: 1-18. Shnirelman, V. A,, 1992, Complex Hunter-Gatherers: Exception or Common Phenomenon? Dialectical Anthropology 17: 183-196. Stordeur, D. 1981, La Contribution de l'Industrie de l'os à la Delimitation des Aires Culturelles: 1'Exemple du Natoufien. In Préhistoire du Levant, edited by J. Cauvin and P. Sanlaville, pp. 433-437. CNRS, Paris. Tchernov, E., 1991, Biological Evidence for Human Sedentism in Southwest Asia during the Natufian. In TheNatufian Culture in the Levant, edited by O. Bar-Yosef and F. R. Valla, pp. 315-340. International Monographs in Prehistory, Ann Arbor, Michigan. Unger-Hamilton, R., 1991, Natufian Plant Husbandry in the Southern Levant and Comparison with That of the Neolithic Periods: The Lithic Perspective. In TheNatufian Culture in the Levant, edited by O. Bar-Yosef and F. R. Valla, pp. 483-520. International Monographs in Prehistory, Ann Arbor, Michigan. Valla, F. R., 1981, Les etablissements Natoufiens dans le Nord d'Israel. In Prehistoire deLe-vant, edited by J. Cauvin and P. Sanlaville, pp. 409-419. CNRS, Paris. Valla, F. R., 1987, Chronologie Absolue et Chronologie Relative dans le Natoufien. In Chronologies in the Near East, edited by O. Aurenche, J. Evin and F. Hours, pp. 367-394. British Archaeological Reports International Series 379, Oxford. Valla, F. R., 1991, Les Natoufiens de Mallaha et l'espace. In The Natufian Culture in the Levant, edited by O. Bar-Yosef and F. R. Valla, pp. 111-122. International Monographs in Prehistory, Ann Arbor, Michigan. Watkins, T., 1992, The Beginning of the Neolithic: Searching for Meaning in Material Culture Change. Paléorient 18:63-76. Watkins, T., Baird, D., and Betts, A,, 1989, Qermez Dere and the Early Aceramic Neolithic of Northern Iraq. Paléorient 15: 19-24. Watkins, T.,Betts, A,, Dobney, K., Nesbitt, M., Gale, R. and Molleson, T., 1991, QermezDere, Tell Afar—Interim Report No. 2. Project Paper No. 13, Department ofArchaeology, University of Edinburgh, Edinburgh.